It is recommended to choose simple control over than tilt control. The main advantage of simple control is you can switch directions quickly than tilting your device. There are three camera options: Normal, Close, Retro. Normal and Close are the best camera options because it gives you more control/handling in your driving. Choose Normal if you want more view, otherwise choose Close if you want better control/handling in your car but sacrificing more views. Retro can be use to memorize the entire track and track shortcuts. 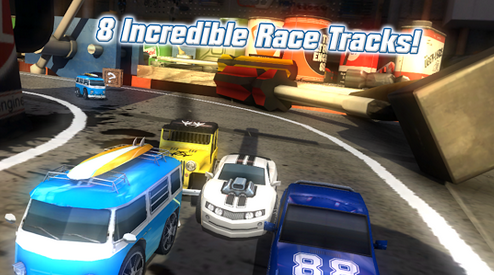 There are 8 tracks to race in Table Top Racing. Some tracks have shortcuts, use them as your advantage. Being at the first position has many advantages. You are safe from bombs and if you have a far gap between the current second position, you also safe from EMP. Most importantly you can get power ups more easier. You can follow my guide to be able to play Table Top Racing more easier. For the first championship, either of the default cars can actually finish the championship without upgrades. So save your earned coins until you finish your first championship. Don't aim for the three stars for each tracks in the tournament, aim for three stars for the final tracks and until you finish the tournament. You can get three stars easily if you have a powerful car, so finish the tournament first. When you finish a tournament you can get new unlock car. This new car will help you finish the previous tracks with three stars. It is more easier if you upgrade them with your saved coins. Just stop your upgrade to your current car if you get all stars from the previous championship. Your upgraded car is enough to finish your current championship.